Maid in Australia: The Doctor down under! Confession: I never liked Dr Who. When I was a little girl, the first episodes I saw freaked me the hell out, and scarred me for life. Recently, the kids' Dad gifted them with the entire series 5 set of DVDs. They've always liked watched Dr Who, so I thought I better join in and see what the fuss was all about. So, we were interested recently when the new Dr Who was announced - Peter Capaldi in case you've been living under a rock! Even better, The Doctor is coming to Queensland - in the form of The Doctor Who Symphonic Spectacular with the Queensland Symphony Orchestra. 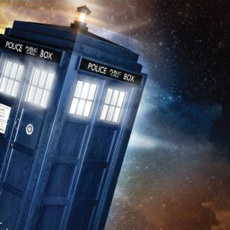 To be staged on February 8 next year, at the Brisbane Entertainment Centre, the show is based on the recent Doctor Who 50th Anniversary Proms in the UK. The spectacular will feature 22 incredible monsters, including the spine-chilling Silence, Daleks and Cybermen, Vampire Girls and more. The technical mastery, scale of production and complexity of arrangements represents one of the biggest events in the history of the Queensland Symphony Orchestra. It's said to be a musical celebration of the iconic BBC series, and will showcase Murray Gold's captivating music, and a big screen featuring specially edited sequences of Matt Smith's performance as the Eleventh Doctor. Can you wait? My kids can't! What an awesome way to get kids into the orchestra too. My husband's a huge Dr Who fan. In the early days of our marriage I used to get home from work when it was on and wasn't allowed to talk until it had finished. That's one of the reasons that I still don't like ABC and its no-adverts during a program policy. Oh dear, this is where I confess that I've never seen Doctor Who along with Star Trek or Star Wars! But it sounds fun! Char, you were obviously very forgiving! I don't think I'll ever become a fan as such, but I didn't mind it at all. And would really like to take the kids to see this show. And NQN, I draw the line at Star Trek and Star Wars. I once lived with a couple who watched Dr Who every night at dinner. I hadn't seen it before but I kind of got into it, which is what happens when you kind of have no other option, I guess. But, anything I've seen since just hasn't drawn me in. I only like that one particular doctor it seems. The one with the curly hair and colourful scarf.